We all have experienced bad hair days at some point or the other in our lives where our hair became very dry, damaged and easily prone to breakage. And I am sure you are aware of the emotional distress that dry and damaged hair may cause to you. While exposure to a lot of pollution or other health complications have been prominent causes behind the increasing hair issues, interestingly, most of the time the root cause of dry and damaged hair is self-induced. Now, you may be wondering as why on Earth will you yourself be the cause behind dry hair and hair damage. Then, let me tell you that many times, you get indulged in hair styling so much that you completely forget how much damage the chemical substances may cause on your hair. And, when you finally realize it, most of the time, the damage is already done. Therefore, it is important that you identify what actions of yours is having negative impact on the health of your hair and then try to fix the problem as fast as you can. I always believe that it is never too late to act maturely and so if you are also eager to fix and repair dry and damaged hair, then keep reading this post. Because, today am going to talk about how to identify and repair dry and damaged hair easily at home. Our hair strands have 3 different layers. The innermost layer is medulla which is surrounded by cortex, which is the middle layer. The outermost layer is called cuticle which is the main protective layer that protects the hair from all of the harshness. When this cuticle is damaged, your hair gets exposed to the harshness and eventually becomes very weak and unhealthy. There can be many factors which may lead to dry and damaged hair. Being aware of what may cause hair damage will certainly help you in fixing and repairing. 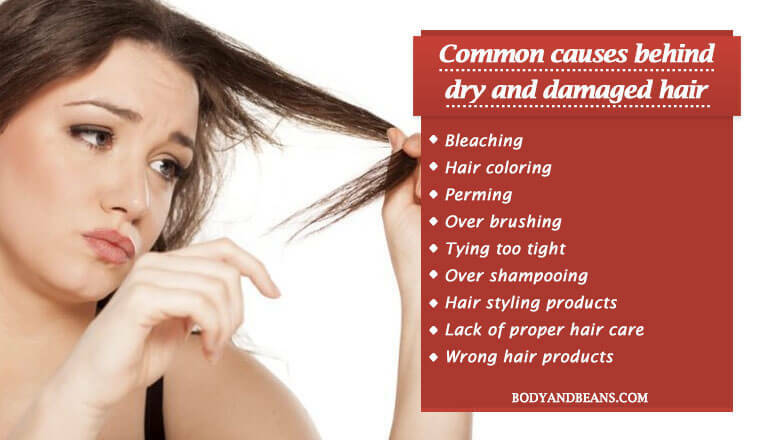 It is important to note some of the most common causes behind hair dryness and damage. Bleaching– When you are bleaching your hair, it is actually forcing the cuticle to open so that the pigment from your hair is removed. So, naturally it is causing a lot of damage to the cuticle which in turn, hampers the overall health of your hair. Hair coloring– Most of the commercial hair color products contain harmful chemical substances. So, when you repeatedly apply them on your hair, your hair becomes very rough and damaged. It is best to keep your hair natural but if you love coloring your hair, then maybe you can try natural ingredients to color your hair. Perming– Here, the hair structure is altered to make it curly or straight. It is done with the help of chemicals that break the bonds of your hair and then again rejoins the bonds in a different way. This leads to a lot of hair damage. Over brushing your hair– If you brush your hair too much and that too inappropriately, then there will automatically be a lot of friction and that is enough to make your hair roots weak and break your hair. Tying your hair too tight– Many of us have the habit of tying the hair too tightly or putting our hair up all the time. This often puts a lot of pressure on the hair roots and weakens them. Over shampooing– Too much shampooing of your hair robs the hair off all the natural oils and eventually makes it very rough, dry and damaged. Hair styling products– The hair styling products may be another reason for damaged hair. So, it is best that you limit the usage of blow dryers, curling irons, flat irons etc. Lack of proper hair care routine– If you do not take proper care of your hair, it is bound to get damaged easily. Using wrong hair products– Now, even if you are taking care of your hair, you need to be sure that you are using the right hair care products. Just be sure that the hair care products that you are using are not drying and damaging your hair. How to identify the sign of dry and damaged hair? Now, that you know the causes, it is equally necessary that you identify the signs so that you can start with the remedies fast. Texture is rough– When you will hold your hair and rub your hand over it, you will find it is rough and the ends are sticking out. So, that is one of the common signs of damaged hair. Lack of shine– Healthy hair always has a healthy shine but if your hair looks dull and lifeless and without any shine, then it must have got damaged. Split ends– If you see that the ends of your hair are sticking out and are split into two, then it is a clear sign of damaged hair and so you got to do the trimming fast. Lack of moisture– If your hair lacks the moisture, then it is definitely damaged and you need to work on it fast. Too much hair fall– Now, this is a very common and a serious issue and if you are also experiencing too much of hair loss, then it is obvious that your hair is not healthy and strong, so you need to take care of your hair. Too many tangles– If your hair gets tangled easily and results in knots, then this may be the sign of hair damage. I hope by now, you have learned about the causes and the symptoms of dry and damaged hair, so I will now talk in details about how you can fix your damaged hair. Therefore, without wasting much time, let us continue with the easy ways to identify and repair dry and damaged hair. You can only have beautiful hair if you know how to maintain it. If you want your hair to be in good and healthy condition, then you have to stop using unhealthy hair damaging chemicals on your hair. Instead, you must take up precaution and go for proper hair care procedures to bring back the lost shine in your hair. Once you have identified that the condition of your hair is matching with the signs of damaged hair that I have mentioned, then you cannot afford to wait and delay any more. You need to start acting on your hair and have to follow the tips and the tricks that we are going to discuss below. 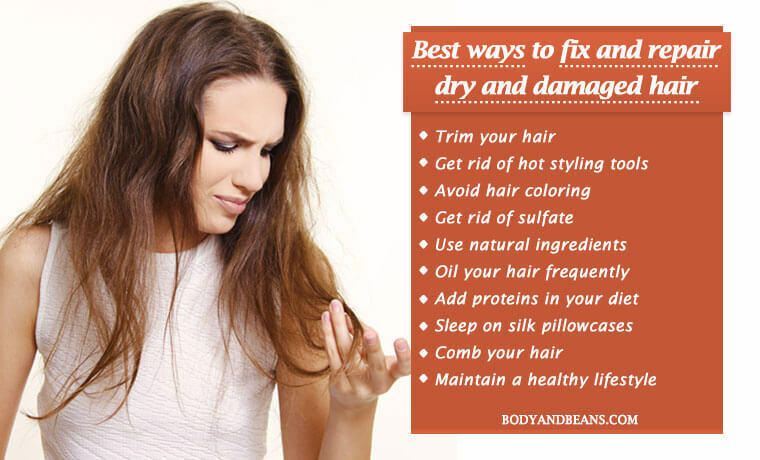 Listed below are a few of the easiest and best ways to fix and repair dry and damaged hair at home. Sometimes, just trimming the hair does the trick and you definitely need to give it a try. I am not asking you to chop off your hair too short but you just have to trim your hair so that the split ends are gone. This will make your hair look much better than it used to look with all the split ends. Moreover, it will also enable fast hair growth. You may also get a trim with layers as that will also help in getting rid of the hair damage. However, when you are going to trim your hair, make sure you visit a good parlor. Avoid going to the cheap salons as they may be using scissors that are not too sharp which in turn is not good for your hair and may actually cause more harm. It is best you tell your stylist from before to use very sharp scissors so that you get a clean cut. Cutting out heat completely will help you a lot in making your hair recover fast. So it is best that you hide all your hot styling tools or keep them in places where you cannot have access to them. Trust me, it is very much needed for your own good and the sooner you understand, the better it is for you. Please let your hair dry naturally and you better try out styles that do not require usage of heat. By just avoiding too much of heat, you will be able to fix and repair dry and damaged hair much faster. You may like all of those funky colors on your hair but if your hair has got damaged due to the usage of all of those chemical based products, then it is best to stop using them for your own good. The chemicals used in hair color may be harmful for your hair, and they simply make your hair very dry and lifeless. So, please avoid applying colors on your hair and let your hair recover from the damage and dryness. However, you can definitely take the help of natural ingredients to color your hair because these are much safer than the commercial products found in the market. If you are seriously looking to fix and repair dry and damaged hair, then you should only use shampoos and conditioners that are free of sulfate. As far as shampoos and conditioners are concerned, it is best that you go for the ones that are devoid of the harsh chemicals like sulfate or sodium lauryl sulfate. These products may cleanse your hair but, in the meantime, they also strip away all of the moisture content from the hair and make your hair excessively dry and damaged. Therefore, please go for hair products that are more natural. And, as far as the conditioners go, you can make your own homemade conditioner as well to get rid of dry hair issues. Also, once any particular product suits your hair type, it is best that you stick to it till the very end. The reason is you may like doing the experiment on your hair but your hair may not be OK with it. However, remember to shampoo your hair 2-3 times weekly and not more than that as over shampooing is one primary cause behind your hair getting too dry. As you know that most of the hair care products available in the market may contain chemicals. And if that’s the case, then instead of repairing your hair, these chemicals may lead to more damages. Therefore, it is safer to switch to natural ingredients as far as nourishing your dry and damaged hair goes. In fact, I believe the using natural remedies are one of the most effective ways to repair dry and damaged hair. You may not be aware, but there are several natural ingredients that can actually condition your hair and make your hair healthy and smooth. These ingredients are the perfect recipes to fix and repair dry and damaged hair. So when your hair gets all the nutrients in the right amounts, it shines healthily. Moreover, the remedies are very easy to use and most of the time the ingredients used in these remedies are readily available in your home. And, yes, they are also very cost effective. I had written one particular post on dry, frizzy hair and had mentioned a list of natural ingredients that can actually help you get rid of the dryness. The post had helped many of the readers. I hope that if you follow these remedies, you also will be highly benefited in getting rid of dry and frizzy hair. When your hair gets too dry and damaged, you can never skip the process of giving your hair a proper oil massage. This is because oils will repair the dryness and will help you regain that lost shine and hence oiling is considered to be the best way to fix and repair dry and damaged hair. Also, oils like coconut oil, castor oil, olive oil, etc. when properly massaged on your scalp and hair leads to proper blood circulation which in turn, helps in hair growth. They also penetrate deep inside the roots and make the roots of the hair very strong that prevents easy hair breakage. Oil generally forms a protective barrier around the cuticle and leaves your hair shaft nourished. While coconut oil has excellent penetrating properties and nourishes your hair with its chain of fatty acids, the castor oil, on the other hand, fills in the damaged keratin spots of your hair with the help of the rich protein content in it. Therefore, make it a habit to do oil massaging every time you shampoo your hair. Do it minimum 2 hours before you shampoo. One of the best ways to repair dry and damaged hair is by having proper diet which must include proteins like eggs, fish, soy, yogurt etc. Your hair is made out of proteins, so naturally when it is dry and damaged; you will have to give it a protein boost in order to make it healthy and beautiful again. However, remember that much protein intake with inadequate moisturization of your hair will make your hair very weak and brittle. So please try to continue with conditioning of your hair without any negligence. When you sleep, your hair goes through a lot of friction with your pillow which actually can create lot of damage to your hair and may even cause a lot of hair breakage. But, you can reduce the friction if you sleep over silk pillowcases and therefore prevent your hair from getting damaged. The kind of brush you are using is very important and combing with a good comb will definitely help you prevent hair breakage. If your hair is already damaged, then it is more prone to get entangled all the time. Hence it is best that you use a wide tooth comb as that will create less friction and will lead to less hair fall. Also, brush your hair in a gentle manner so that the roots of your hair are not put under too much of stress. Avoid harsh and over brushing your hair. And, yes, keep your brush clean so that there is no build up over it which can otherwise lead to growth of bacteria on it and will harm your hair all the more. So, wash your comb thoroughly at least once monthly using baking soda and lukewarm water. 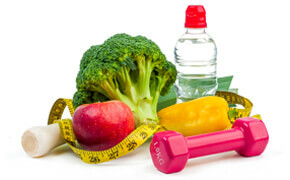 Maintaining a healthy lifestyle is the primary road to healthy life and if you are healthy and free of diseases, it is bound to get reflected on your hair. In other words, maintaining discipline in life starting from eating a healthy diet, having proper sleep, getting rid of the unhealthy practices like too much of smoking and drinking, doing regular exercises to socializing a lot and keeping yourself stress free, all of these contribute to good hair health. So it is best not to compromise with the quality of your lifestyle. What are you doing to fix and repair dry and damaged hair? Hair forms an important part of our external beauty and having beautiful long locks definitely is a big asset. But, sadly, the number of hair issues is increasing on an alarming basis and it has already turned into a serious problem among men and women of all ages. Now, having bad hair days can be a result of various causes, some of which are environmental and others may be health related. However, there are some causes which are self-induced. In other words, we often get involved in so much hair styling that we forget that some of the practices can actually harm our hair a lot like for example, using hair colors, too much usage of hair styling products, then using shampoos that are not appropriate etc. We have already discussed about the causes of dry and damaged hair so that you try and avoid those mistakes. But if you have already done the damage to your hair, then it is time to take part in some quick damage control actions. The 11 easiest ways to fix and repair dry and damaged hair, as discussed above, should help you get it right. All of the tricks discussed above are very simple, but when applied correctly, they can make a lot of difference in the quality of your hair. Try incorporating these as a part of your hair care routine and see how it works for you. However, in case you find that nothing is working in your favor even though you are applying all of the techniques as discussed above, then maybe you should consult a doctor. Do you follow any of these hacks to fix and repair damaged hair? What else do you do to take care of dry and damaged hair? Which of these hacks have worked for you? Feel free to share your favorite hacks and tricks that might have helped you to fix and repair dry and damaged hair. I will be happy to update the list accordingly. Until then, stay beautiful and say goodbye to bad hair days. Previous PostHow to Get Rid of Migraine Headache Using Home Remedies?